Brothers Anil and Sanjay Kapoor Gatecrash Sunita Kapoor's Birthday Bash and Their Picture With The All Ladies Gang is Simply Amazing! Actor Anil Kapoor's wife Sunita Kapoor celebrated her birthday today. 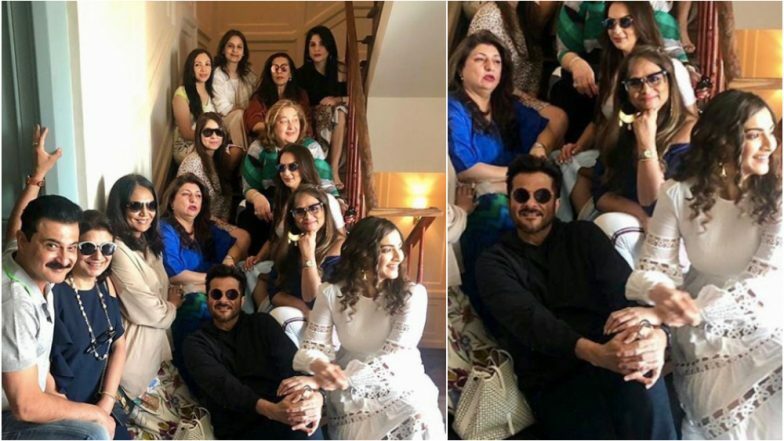 The Kapoor lady celebrated the big day with an all ladies-lunch along with all the gorgeous girls from the Kapoor clan including daughters Sonam and Rhea along with Janhvi Kapoor, Khushi Kapoor, Anshula Kapoor, Shanaya Kapoor, Maheep Kapoor, and others. What's interesting is that this birthday bash was gatecrashed by two members. Any guesses? Well, it was none other than Anil Kapoor and his brother Sanjay Kapoor. It looked like one big happy family picture. Sharing the lovely moment on his Instagram, Sanjay Kapoor wrote, "When the brothers gate crash a ladies lunch." In another picture, actor Anil Kapoor is seen posing with Janhvi, Sonam, Shanaya and wife Sunita Kapoor. Anil Kapoor’s Birthday Post for Wife Sunita Is Too Cute for Our Weak Hearts – View Pic. Earlier this morning, Anil Kapoor had shared a picture of him and Sunita Kapor from their younger days. The couple have been together for several years now and are considered to be one of the strongest Bollywood couples. The couple had dated for over 10 years before they tied the knot. Malang: Twitter is Crushing Over How Anil Kapoor at 62 Is Looking Younger Than His Co-Stars - Read Tweets. On the work front, Anil Kapoor will be next seen in Mohit Suri's Malang which has recently gone on the floors. The film will also star Disha Patani, Aditya Roy Kapur and Kunal Kemmu in lead roles.